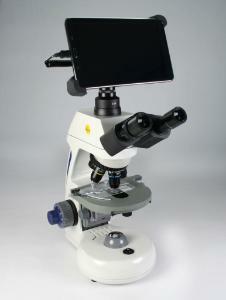 The latest in Swift Optical’s line of digital compound microscopes features an integrated LCD tablet. The microscopes combine the features of Swift’s popular M10 advanced microscope with a tablet system that offers unlimited possibilities. The pre-loaded MotiConnect App has image-capture, annotation, measurement, and sharing functions. The Wi-Fi function permits users to connect to a computer and utilize the included Motic Images Plus software. This microscope series integrates quality construction with tablet technology to be an all-in-one digital microscope solution that's fully functional without a computer.